Suzanna McGee is a former Ms. Natural Olympia drug-free bodybuilding champion, now competitive tennis player, expert athletic trainer, speaker and author of The Athlete’s Simple Guide to a Plant-Based Lifestyle and Tennis Fitness for the Love of it. She is certified by the National Academy of Sports Medicine as a performance enhancement specialist and corrective exercise specialist. She has over twenty years of experience in athletic training. With great success, Suzanna has become a plant-based athlete, raw vegan, and has earned a certificate in plant-based nutrition at eCornell University. Besides her love of sports, learning, and teaching, Suzanna has two master’s degrees in computer science, and speaks six languages. This Czech native resides with her vegan chocolate Labrador in Venice Beach, California, USA. I used to be a drug-free bodybuilder (and former Ms. Natural Olympia champion) and I used to eat so many animal products because I believed I need them to grow, just like many bodybuilders 15-20 years ago used to believe. Then I started to play competitive tennis and slowly transitioned to a lighter diet, with very little meat, but still a lot of dairy. I was almost vegetarian. Then a few years ago, many of my still young friends and family member started to pass way from cancers and heart disease, and I felt this is not how it is supposed to be. We should be able to live until at least 100 years old, so I started to do more research and learn so many amazing things about the plant-based diet and the dangers of animal products. I became plant-based. As I was promoting the health message of eating plants to my students and friends, I was looking more into how the animals are treated and I was horrified. The animals don’t deserve to live and suffer for us like this. I became vegan. I have been vegan for the past two 2 years after being semi-vegetarian for maybe 6 years. The last year, I’ve become a raw vegan. Besides the feeling that I am doing something really great for the fellow animals, who I love so much, I also feel great health benefits and performance advantage in my tennis and strength training. I have a lot of unlimited energy, I recover really fast, and I plainly enjoy all the plants I eat. There is no better feeling than eating all the crunchy, juicy, plants and knowing that I have saved another animal life. Compassion for every living being. I love animals and nature so much, and it doesn’t make any sense to treat animals so viciously and destroy our environment and nature at the same time, while we are making ourselves sick, fat, and slowly dying. I have supported many different animal organizations all my life and being vegan makes absolute sense to me. I just don’t understand why I hadn’t transitioned to this state much earlier. Even my dog, chocolate Labrador Zuzi, is a vegan dog and she is thriving. We both are great examples for many other animal lovers out there. After being a cross-country skier in my teens, then downhill skier, in my 20s, drug-free bodybuilder in my 30s, I became a tennis player in my 40s. I love all sports. Now I mostly focus on tennis and to be a great player, I need to work on my strength, agility, endurance, and flexibility. I train almost every day. I take a day off maybe every other week, if I feel like I am getting run down. Being on a raw vegan diet gives me so much energy, that I feel I need much fewer off-days. I walk or jog every morning with my dog, for about one hour – I’ve been doing that every day, for the past six years. I play tennis about 5-6 hours a week, do strength training for about another 5-6 hours per week. Stretching or yoga and myofascial release, I do every day a little bit. Yes, I am a performance coach and an injury prevention specialist. I love to focus on tennis players, because I have realized how tennis players need good fitness training, and they are not even aware of it until they get a lot of imbalances and then many injuries. Even though tennis players are my main focus, I do also train seniors and enjoy that very much because it feels like I give them another 20 years of youth when they feel strong, balanced, and fit. I train a few juniors as well, and many non-tennis players, too. With my experience of at least 20 years of training athletes, and participating in many different sports through all my life, I can offer good training to almost anybody. Tennis is my main sport now. Strength training and building the body in the gym is a part of my focus on being balanced, fit, healthy, and strong. Yoga is good for my flexibility and my mind. I do love many other sports, like swimming, roller-dancing, skiing, running, etc. but I only have time for the above mentioned. I think there are two major misconceptions that I am observing. The first one is physical. People think that vegans are weak, scrawny, sickly people who just melt away and die after a while. This is so far from the truth. The other one is that people often think that vegans are aggressive, pushy, and rude by promoting their message of not hurting the animals and eating plants. They don’t realize that the majority of advertisements all around us are from the meat eaters and meat industries. They don’t see that as pushy or aggressive. Addressing the physical misconception is easy - I just flex my muscles while telling them that I am raw vegan. 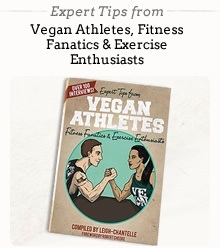 I also mention many other super strong and fit vegan athletes. Then I explain that the scrawny people possibly don’t eat enough calories and that such people are among all groups, vegans or non-vegans. A little education goes always long way. Regarding the second misconception, that one is a bit harder, because if I get too much into it, then I confirm to them that I am “pushy and aggressive.” I often choose a mellow and more educational approach. I explain about the indoctrination of animal products, the TV ads, the health issues caused by the animal foods, and when they start getting more interested, I can win them over. I have amazing amounts of energy and mental clarity. I recover really fast, I feel quick on the tennis court and strong in the gym. My personal challenge may be that I love nuts. I am a nut addict, I could almost say. While this doesn’t sound so bad, I really can eat a pound or more every day, which definitely is too much. Being raw vegan, not all nuts are raw. I always buy peanut butter for my dog, and then I am “stealing” spoons from her jar. It is really challenging to control myself. Otherwise, I don’t have challenges like some other people may have, that they crave some non-vegans food. I love my lifestyle and I am not tempted ever to eat non-vegans foods. I find that people do not understand well what being vegan means. They don’t understand how healthy and delicious it is to eat all the plants. After I explain, they are more open. But, in the gym and among the weight lifters, bodybuilders, and fitness competitors, there it is much harder. The majority believes that animal products are extremely important to grow muscles, and it is hard to explain. I understand that, because I used to be like that too. If somebody is open-minded, I very gladly explain to him or her all the benefits. In the beginning of my vegan journey, I had so many naysayers and negative people discouraging me, but now when I can show the great results, it is much easier. I’ve always turned the negativity into fueling me and helping me to achieve what they thought was impossible. I have also published a book for athletes and how to transition to the plant-based lifestyle - that gives me more credibility too and people leave me alone now. They are now, but in the beginning they were a bit against it, they thought it’s crazy and that I cannot do it, it’s not healthy and all many other reasons. I always educate myself well before I do something, so every negative comment just kept me going and making me to learn more. The first question is the famous one, “How do you get your protein?” I often reply with a question “How do you get yours and how much do you get?” They are often very surprised because they don’t have a clue. Then I explain to them how much we actually need - it’s not as much as they believe - and how the plant-based diet supplies the perfect amounts of protein. The next question is, “What do you eat?” I patiently explain all the great foods I eat. I don’t eat any processed foods - everything is mostly fruits, vegetables, nuts, seeds, legumes, and meals out of those. When I start describing some delicious meals, they are truly impressed and feel like they want to try some of them. I am a quite self-motivated and driven person. However, sometimes I need to keep the fire going. So for my training, I look at the athletes who are persistent, disciplined, hardworking and never complain. Their drive drives me. Especially the vegan athletes who have to go through similar negativity from people, and they keep going, thriving, achieving, and motivating others. In my personal life, all the people, who tell me that I am a great inspiration for them with my training, social presence, and my writings, motivate me. Each time I hear a “thank you”, I am determined to help another few. This is the best feeling. Because I am an author and a promoter of this great vegan and plant-based lifestyle, I feel like I need to be in great shape to show that I practice what I preach. That motivates me. Breakfast - I have figured out that the best breakfast for me is a freshly squeezed juice. I drink about 40-48 oz. of it, and it gives me amazing energy for my training (which I do after the breakfast) while my stomach and digestive tract is nicely light and empty. Sometimes I have a smoothie instead of a juice, but I think I feel more energy with the juice. Lunch - If I don’t need to hurry to my next clients, I make myself a huge bowl of salad, with different greens, veggies, some fruits, nuts, avocado, sprouted lentils, etc. It is a huge bowl, maybe 4 pounds of salad. I take all the time to chew slowly and enjoy this moment of peace. If I am in a hurry to get somewhere, I make a nutritious smoothie and have the salad for dinner. Dinner - Either a salad that I didn’t have for lunch. If I had the salad, I am often still pretty full, so I make something light, maybe squeeze another juice, or just a few pieces of fruit, or some nuts and dehydrated homemade snacks. Snacks (healthy & not-so healthy) - Fruits are the best snack for me. Then I also love to snack on the nuts, but as I mentioned before, I try to avoid this because when I have one nut, I am able to eat the whole pound. I have no self-control when it comes to nuts. Protein - Sprouted lentils or other legumes. Spirulina and hemp that I add into my smoothies. Peas and dried peas as a snack. Occasionally, I add a plant-based protein powder. Calcium - All the leafy green vegetables that I add into my smoothies or salads; raisins that are my favorite snack; oranges that I add to salads or make a smoothie from. All the nuts that I try not to over consume are great too. Iron - Sprouted lentils, green leafy vegetables, sprouted quinoa, and nuts. It’s my morning freshly squeezed juice from carrots and apples, with ginger and turmeric (anti-inflammatory). Not daily, but sporadically I take vitamin B12. I also take probiotics sometimes, and if I have huge meals, I may take extra digestive enzymes when I feel like my digestion is a bit weaker when I am too tired. Gaining muscle - Work hard in the gym and eat enough calories - I cannot stress this enough! Often vegan athletes don’t eat enough because of the volumes of foods they need to eat to get the calories in. I don’t have this problem, because I love to eat. Losing weight - Create a deficit about 500 calories a day and don’t rush the weight loss. Be patient, train hard, eat a bit less than normally, and don’t starve yourself. You need energy for all your training. Maintaining weight - With some experience, you will find your caloric needs to maintain your weight. Keep weighing yourself daily so you know where your weight is heading, and preferably keep a food log as well, so you can reevaluate when something goes differently than you’ve planned. Improving metabolism - Train hard - gain a lot of muscles. I educate people, very gently. I tell them how great my meals taste, how much energy I have, and how greatly I recover. All these things are easy for people to accept and they are tempted to try. Then I go deeper into how the animal products are unhealthy and how the poor animals are mistreated. This is often a very sensitive subject, so I have to show some tactfulness when I get into it, so I won’t scare people away. In social media, I publish healthy, motivating messages and try to encourage people to add more plants in their diets. From my experience, if they add a bit more, then even more, eventually they may become completely plant-based because they feel so great. From plant-based to veganism is just a little step. It is often a very natural progression. I am very active on FaceBook and Instagram, where I post motivational photos of training and raw vegan foods. People can connect with me there or through my website. My book The Athlete’s Simple Guide to a Plant-Based Lifestyle is available on Amazon and I think it could help anybody, athlete or non-athlete, to get more involved with this great lifestyle.